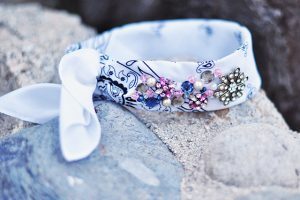 Besides wearing a bandana stylishly on your head you could also design them into a necklace by embellishing with marbles, beads, buttons and other decorative items. If you do not want to work so hard though, there is always an easier alternative. 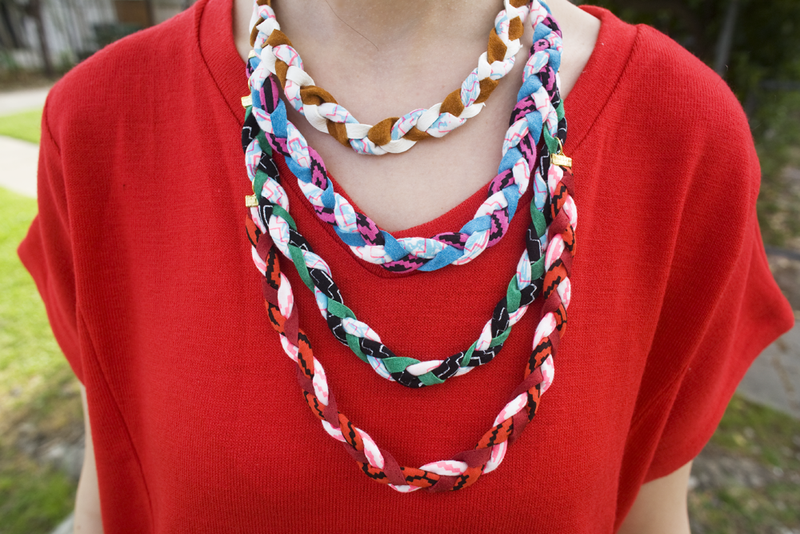 Just wear or tie your bandana in a way that it resembles a cute necklace. These enticing neckpieces often serve as chic accessories if you have a casual or beach themed party. 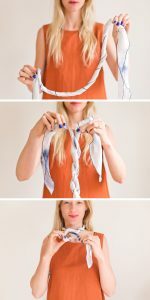 Check out the tutorial instructions below alongside the interesting ideas to make cool bandana necklaces at home. 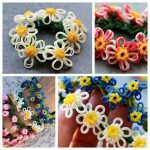 Colorful small balls or big beads can also be alternately used. 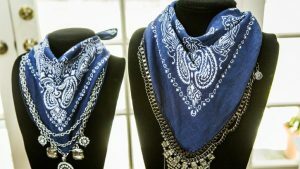 If you have a white bandana consider tying nd dying it before shaping it into a necklace. 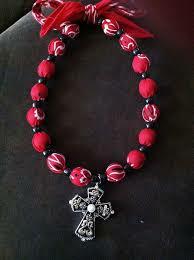 This is another unique design just the same as given in the above DIY, the cross being the only addition. 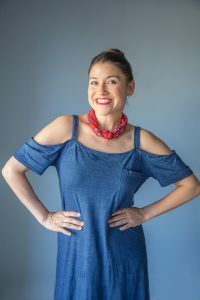 Following the instructions in the given tutorial, you could make a showy necklace like this one, using a bandana and wrapping it around with leather straps or cord to get a tie-like effect. 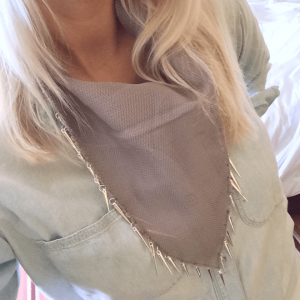 The gems and jewels on the choker necklace intensify its beauty. If you are making one with a red or golden yellow bandana go for black stones for a contrasting effect. 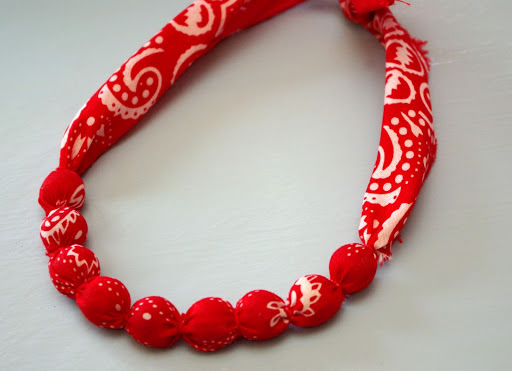 Take your bandana and twist it in the method shown in the above tutorial, to make an easy yet smart necklace just as the one in the below-mentioned picture. 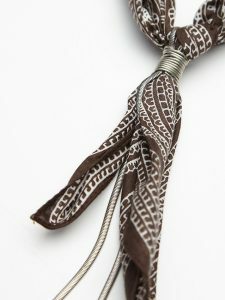 Attach metal rings and beads to the edge of your scarf and get something magnificent as the one in the image shown here. Replace the t-shirt with your upcycled bandana. Cut it into 12 or 14 strips and then go by the rest of the instructions given here. 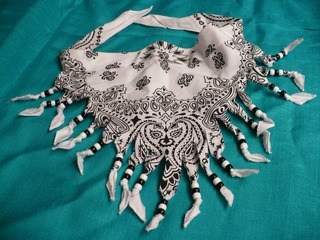 This neckerchief would look absolutely elegant when teamed with formals. The charms or jewelry attached to the bandana makes it look immensely gorgeous. A showy stone at the center adds to its beauty. 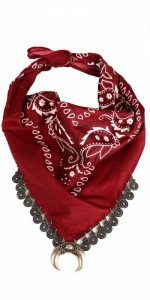 If you choose to make it for any male member, go for a black or silver colored bandana and attach metal rings at the bottom for a manly design. With the above instructions at hand you would get ample of exciting ideas to use your upcycled bandana and make fascinating necklaces out of them. 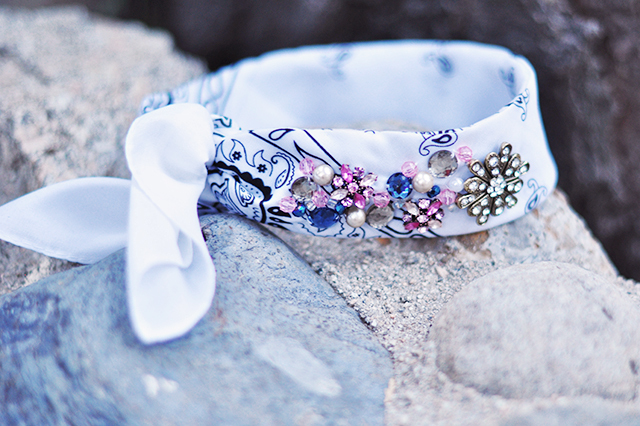 Pair it with a cool bracelet and headband for a complete set.